Head and shoulders portrait of John Frederick Daniell in right profile and leaning over an electric Daniell Cell battery [?]. 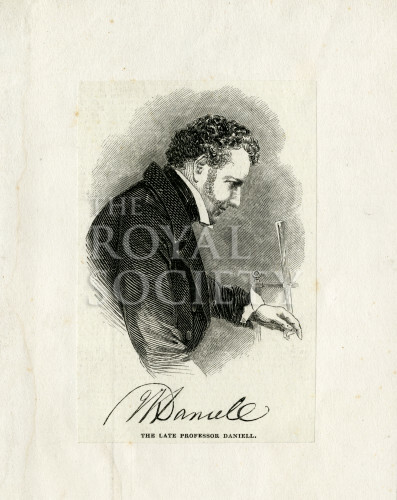 John Frederick Daniell (1790-1845) was a British physicist and chemist, he was elected a Fellow of the Royal Society in 1814 and was Foreign Secretary to the Society from 1839 until 1845. Provenance: Noted in Catalogue of the prints in the possession of the Royal Society, by Henry George Plimmer FRS (1856-1918), manuscript, p.15.